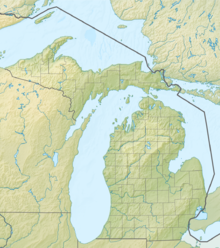 Gaylord Regional Airport (IATA: GLR, ICAO: KGLR, FAA LID: GLR) is a county-owned, public-use airport located one nautical mile (2 km) southwest of the central business district of Gaylord, a city in Otsego County, Michigan, United States. It is included in the Federal Aviation Administration (FAA) National Plan of Integrated Airport Systems for 2017–2021, in which it is categorized as a local general aviation facility. Gaylord Regional Airport covers an area of 1,572 acres (636 ha) at an elevation of 1,328 feet (405 m) above mean sea level. It has two asphalt paved runways: 9/27 is 6,579 by 150 feet (2,005 by 46 m) and 18/36 is 4,200 by 75 feet (1,280 by 23 m). For the 12-month period ending December 31, 2008, the airport had 8,118 general aviation aircraft operations, an average of 22 per day. At that time there were 39 aircraft based at this airport: 59% single-engine, 33% multi-engine, 3% jet, 3% helicopter, and 3% ultralight. The airport is staffed seven days a week from 7:00 a.m. until 5:00 p.m.. It is listed as a tier one airport in all categories of the Michigan Airport System Plan. The airport is accessible by road from Van Tyle Road, and is close to M-32 and Interstate 75. ^ a b c d FAA Airport Master Record for GLR (Form 5010 PDF). Federal Aviation Administration. effective May 31, 2012. This page was last edited on 28 November 2018, at 15:13 (UTC).